This guest post is written by Narendra Rocherolle, who was the co-founder of Webshots, a company that he and his partners sold to Excite@Home in 1999 and then again to CNET Networks in 2004. Now as a partner at 83 Degrees, he has been working on several products including 30 Boxes, fbExchange (sold to TMP), and most recently Power Twitter. When Lance Armstrong sat down with John Battelle at the Web 2.0 Summit last November, he had been twittering for about 10 days and was jokingly asking that “shoe guy” to send some followers his way. 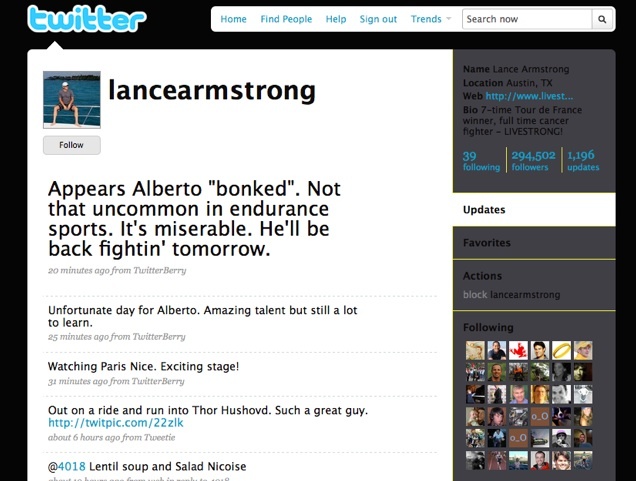 Now four months later, even Richard Rosenblatt, CEO of Demand Media and the guy who helped get Lance into Twitter, has been surprised by how much @lancearmstrong has taken to the platform: twittering and twitpic’n about training, races, travel, family, food, movies, and his mission to grow the fight against cancer. For those of you interested in more than 140 characters, Lance took some time out to discuss his new habit. Q: You started using Twitter back in November. You are now closing in on 300,000 followers and you tweet more times per day than most people brush their teeth. Can you point to a couple of factors that have resonated with you making Twitter part of your daily routine? 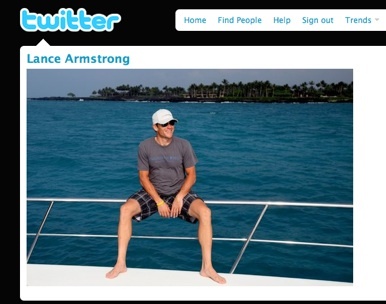 Lance Armstrong: Well, 140 characters fits my personality well. I’m not much for small talk so 140 gets me that. I see long drawn out emails and I delete them. It also brings a certain transparency to my life that others may have never seen or realized. Lastly, it works great for talking about the thing I care about the most (behind my family) and that’s fighting cancer. Twitter builds grassroots movements quicker than anything I’ve ever seen. Q: Can you give an example of something that you were about to tweet but did NOT? Lance Armstrong: I try to keep it positive. There are plenty of times I felt like crushing someone for what they say or did but I avoid it. There’s plenty of negativity on the web as is so they don’t need me adding to it. Try to be careful with pics of my kids/family for obvious security reasons. Other than that, it’s basically an open book. I also will not tweet anything that someone asks me to. It’s my page so therefore I dictate what goes there. They want to tweet it then tweet from their page. It has to be 100% authentic. Q: One thing your critics can not argue with is your success as an extraordinary marketer and personal brand manager. This may sound silly but I’ve heard you described as a “natural” when it comes to Twitter. Can you talk about how you approach building “you” as a brand? Lance Armstrong: Um, hell, I have no idea. Again, I think people are smart. They know when they see something real. I talk about what’s happening “now” and it’s always the real scoop. I’ve been around too long to BS people. 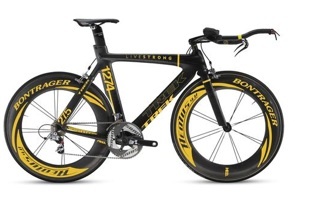 Q: The theft of your time trial bike recently created huge buzz in the twitterverse. Was there an awareness by you (and Trek) that the theft was an incredible marketing opportunity? Lance Armstrong: They (Trek) were devastated. They thought I would be livid and while I was pretty seriously pissed, I told them to chill. The story was on the front page off cnn.com, espn, etc. Hell, it was on perez hilton. For a week or so it was the most talked about bike on planet earth. Bummer to get it ripped off but it was not bad for them. They make bikes as easily as you and I go for a walk. Still, you gotta be pretty dumb to steal a “one of a kind” bike. Q: Have you had any issues or push-back from your Twitter usage (e.g. friends telling you to put the blackberry away! Or moments when you catch yourself thinking you should be twittering something when in fact you should just be experiencing it)? Lance Armstrong: Nah, again it’s short and I type fast. Most tweets I send people don’t even notice. Q: Your Twitter stream depicts a relentless schedule that sounds downright exhausting. Are you traveling/doing more this year than you have in past seasons leading up to the Tour de France? Lance Armstrong: Most definitely. Again, a great thing about the service is that people (fans, journalists, my fellow competitors) realize my life is quite different than theirs. Between my kids, my foundation, travel, training, and racing, it’s a big life. Q: Finally, for the readers out there making the pilgrimage to Austin for SxSW Interactive, would you name 3 restaurants they don’t want to miss? Lance Armstrong: Chuy’s, East Side Cafe, and the Salt Lick. There’s also Uchi, Hula Hut, Eddie V’s, and Fonda San Miguel.